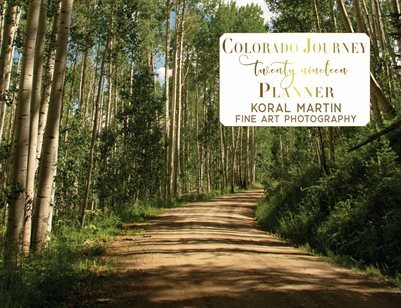 Beautiful Colorado 2019 Monthly Planner with photos by Koral Martin Fine Art Photography. Includes monthly calendars and many pages with lines for all your notes and plans. Each page includes wonderful photos of gorgesous spots all around Colorado. Great planner to have with you and so much more enjoyable and utilitarian than a calendar on your phone. This planner has 58 pages to enjoy. Horizontal and Spiral bound on the left.